The Internet keeps you connected, so help us #KeepItOn! Every night from 7 p.m. until 1 a.m., access to the internet in the Bahraini village of Duraz is disrupted or completely denied by telecom companies, under the orders of the government. This has been ongoing for over four months and, while troublesome, this case is by no means isolated. During the 2011 anti-government demonstrations in Egypt, the government completely unplugged the country to hinder planned protests, inadvertently birthing the #KeepItOn campaign. Partial or complete shutdowns of the internet have taken place in 51 countries in just the first 10 months of 2016. And while security reasons are often cited to justify shutting down or limiting access to the internet, a myriad of other reasons have also been used. In May 2016, SMEX reported that the Iraqi government shut down the internet in all regions of the country for several hours to prevent cheating on official exams. In its own bid to stop cheating, Algeria blocked mobile access to social media during this year’s Baccalaureate exams. Every voice helps, add yours now! Also known as internet curfews, blackouts, and kill switches, internet shutdowns have the same impact everywhere — from Malaysia to Turkey. They hinder access to accurate and timely information, they stifle free speech, and they harm a country’s economy. In times of political unrest, an internet shutdown could lead to an increase in violence and acts of repression while making it nearly impossible to reach essential services and connect with loved ones. Partial or complete shutdowns of the internet have taken place in 51 countries in just the first 10 months of 2016. In the past decade, internet disruptions have steadily increased and so has our reliance on the Internet. This is why SMEX is joining forces with Access Now and Lush Lebanon to ensure that internet access is maintained across the region. Everyone has a stake in this fight, so we’re inviting you to join us! Join SMEX and LUSH at the three Lebanon locations this Friday, Nov. 25, from 5 to 8 pm. Image courtesy LouBou blog. This Friday, Nov. 25, SMEX activists will be in three locations across Lebanon from 5 to 8 p.m. to talk to you about how we can safeguard our human rights online and to invite you to participate in the #KeepItOn campaign of the Middle East. For this occasion, Lush is dropping its Error 404 bath bomb with all profits going to a digital rights fund. So let’s break the silence and use our voices online to speak out now against disruptions to the Internet. Let’s start by demanding world leaders to pledge to #KeepItOn. This is a critical moment to urge them to speak out against Internet shutdowns, as delegates will be gathering in Guadalajara, Mexico, to discuss the future of the open internet. Join SMEX this Friday at one of three Lush stores (Beirut Souks, ABC Dbayeh and ABC Ashrafieh) from 5 to 8 p.m to learn how to #KeepItOn. Add your voice to our petition right now, or anytime before Dec. 7 so we can deliver it to government leaders at the 2016 Internet Governance Forum. 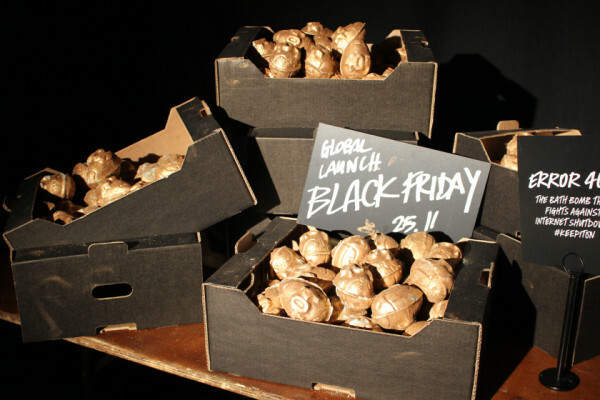 Drop by a Lush Lebanon store, or visit their website, before Dec. 7 to contribute to the #KeepItOn digital rights fund by buying an Error 404 bath bomb.